Location o Banja Luka athin Republika Srpska an Bosnie an Herzegovinae. Banja Luka or whiles Banjaluka (Serbian Cyrillic: Бања Лука, or Бањалука) is the seicont lairgest ceety in Bosnie an Herzegovinae an the admeenistrative caipital o the Republika Srpska entity. 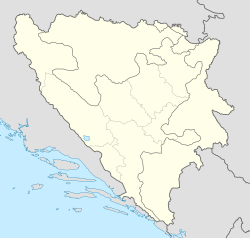 Tradeetionally it haes been the centre o the Bosanska Krajina region, locatit in the north-wastren pairt o the kintra. It is hame o the University o Banja Luka, as well as numerous state an entity institutions o Bosnie an Herzegovinae. The ceety lies on the Vrbas river an is well-kent in the kintras o the umwhile Yugoslavie for bein full o tree-lined avenues, boulevards, gardens, an pairks. Wikimedia Commons haes media relatit tae Banja Luka. This page wis last eeditit on 23 Apryle 2018, at 01:35.